Beauty Professor: Gressa Minimalist Corrective Serum Foundation...A Superbly Green, Chemical-Free Base! Gressa Minimalist Corrective Serum Foundation...A Superbly Green, Chemical-Free Base! Above: The Gressa Minimalist Serum Foundation, foundation brush and Purifying Mist, resplendent in the sunshine. Happy weekend! Today's post is devoted to one of my favorite subjects in the beauty world: foundation. Unlike most of the lovely formulas that I swatch and review, this foundation is entirely green...that is, the short ingredients list (located below) reads like a primer for all things healthy. From Broccoli Seed Oil to Lemon Balm with a cache of antioxidants thrown in for good measure, the *Gressa Minimalist Corrective Serum Foundation effortlessly perfects one's canvas while nourishing the skin from the inside out! Above: The Minimalist Foundation comes in a dark glass bottle (to protect the integrity of the formula) with a glass dropper for precise control of the product. Designed as a hybrid of skincare and makeup, the Gressa Skin Minimalist Corrective Serum Foundation is brimming with ingredients that instantly even the skin while working to improve health on a deeper level with long-term use. I have used this foundation countless times in the past two months and am consistently pleased with the state of my skin during and following application; I attribute this outcome to the hydrating oils (yes, oils!) that synergistically balance my delicate facial area. There is no added scent (it smells a little "earthy" but I don't mind the natural aroma at all!) and my very sensitive skin hasn't experienced a single reaction. In terms of texture, the formula is quite fluid (but concentrated) and 3-4 drops is all that is necessary to cover the entire face. Although it applies sheerly, the formula can be built up to nearly full coverage with some gentle and focused blending (I've used a brush, a Beauty Blender and, most often, my fingers). To its credit, it builds opacity while--somewhat magically I might add--avoiding all signs of cakiness. The final outcome is simply the appearance of really good skin. Because the foundation is so smooth, it glides across the face with minimal effort and leaves the most beautiful soft matte (with a glow) finish. Taking into account the well over 50 foundation formulas I currently have in my possession, I can safely assert that I do not own another formula that duplicates the Minimalist texture or behavior. With regards to lasting power, I get 5-6 hours of flawless wear and only need to touch up with powder on my t-zone if it's a particularly warm or humid day. It’s a serum. It’s a foundation. It’s a multivitamin for your face. Perfect your face with long-term benefits of this revolutionary serum to powder foundation. GRESSA Healing ComplexTM is a proprietary powerhouse blend of carefully selected botanical extracts that care for your skin by providing it with overall balance, radiance and clarity. Minerals provide a tone-correcting coverage natural finish. Above: Initial swatches of all 8 shades in outdoor sunlight. The shades spectrum is equally impressive. Since the formula can be applied sheerly or built to nearly full coverage, there is likely a match for most skin tones. I am currently a mixture of #3 and #4 and am confident that the combination of both shades will adeptly take me through an entire year of skin tone variances. 1. Send a quick photo of yourself (of course all is private and is deleted immediately after we take a quick peek). 2. Let us know a shade that suits you well in any other brand of foundation. Got to love independent, passionate beauty companies that are willing to go the distance for their customers! 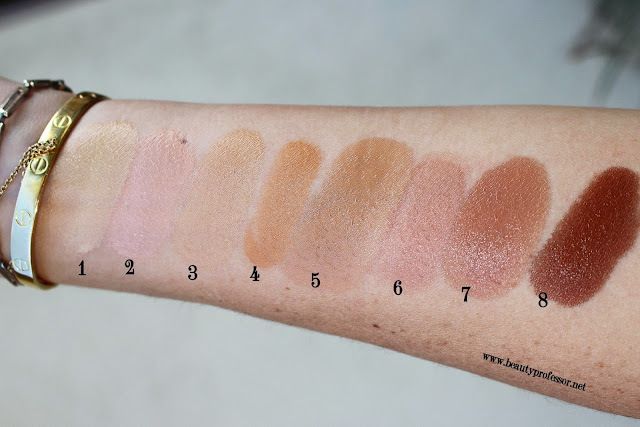 Above: Blended swatches in direct sunlight...the formula is ultra light while still providing stalwart coverage. 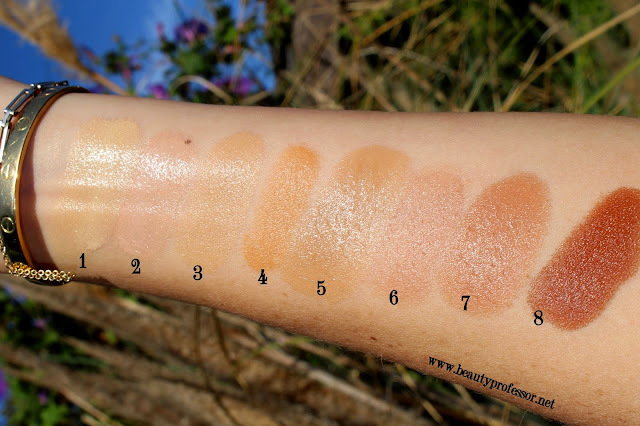 Above: Swatches in direct sunlight...the oxidation for this formula is minimal, and at the point that this image was taken, oxidation had reached its full potency. Above: The shades are so blendable, allowing one to find (or create!) their perfect match for the entire year. As aforementioned, I am a mixture of #3 and #4. 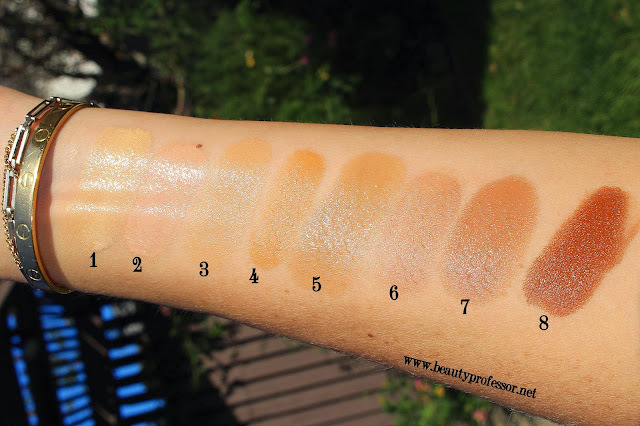 Above: Swatches of all shades in direct sunlight with a flash. Above: Swatches in outdoor shade with a flash. Above: Swatches in outdoor shade, no flash. Above: Swatches in outdoor sunlight, no flash. I also had the chance to try the *Minimalist Illuminating Serum; much like the foundation, this highlighter has a fluid texture that instantly blends with the skin, creating a "lit from within" look that is simultaneously ethereal and entirely natural. 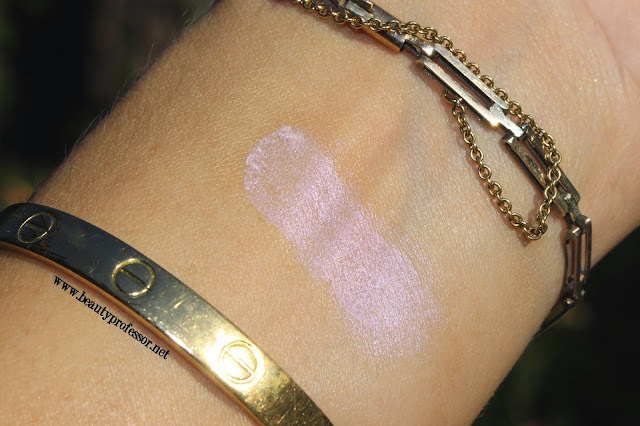 I adore the cool opal sheen and prefer to use my ring finger to tap a few drops along the high points of my face (e.g., cheekbones, bridge of nose and Cupid's Bow) for believable glow. Although I apply it after foundation, it can also be mixed into foundation for an even more subtle effect! Above: A swatch of the Minimalist Illuminating Serum in direct sunlight...the iridescent, luminous opal shade yields the most ethereal glow. Above: I love the Gressa Lip Boost in Radiant, which is a cool-toned medium orchid (that pulls slightly--and delightfully--purple on my lips) with immense moisture for a naturally flushed looking pout. Aboev: The Philip B Oud Royale Forever Shine Shampoo atop a bed of hair. To compliment the natural energy of the Gressa foundation, I coupled the images that follow with the divine Philip B Oud Royale Forever Shine Shampoo (reviewed HERE). This Sulfate and Sodium Chloride-free formula delivers extreme hydration and an intoxicating oud-inspired scent for extremely smooth and shiny hair that feels soft but bouncy...so glad I discovered this formula! Above: Free People Velvet Tank from SHOPBOP (currently having a SALE!). Above: My long, thick, easily-tangled hair is always smoother and more manageable when I use this shampoo! Above: I use the Philip B. formula twice a month and the smooth and shiny effect lasts for days on end. Above: Outdoors without a flash. Above: Outdoor mixed light, no flash. Above: Outdoor mixed light, with a flash. 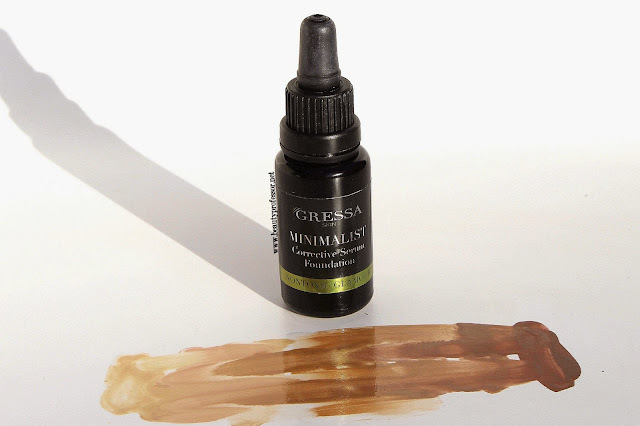 Bottom Line: As I am sure once could ascertain from this post, the Gressa Minimalist Corrective Serum Foundation is the absolute best green foundation I have ever had the pleasure of experiencing. Stellar ingredients aside, its buildable coverage, soft matte (with a flattering glow) finish and significant lasting power rank it amongst the favorites in my current foundation rotation! If you are passionate about base and ardently seek the most natural ingredients, the Gressa Minimalist Corrective Serum Foundation is a must. Have YOU tried any products from Gressa Skin? Thoughts? Beautiful foundation. I was gifted #3. It's the perfect shade for me. It's shear but it covers any little red areas. I personally don't really notice a fragrance. All things considered, I really do enjoy this foundation. Can you wear a primer under this foundation? I have skin texture issues that a good primer helps to blur. Thanks so much, Tatiana! You can wear a primer under this foundation; I generally wear the LMdB Peau Vierge or Napoleon Perdis Auto Pilot. Hi. Sounds and looks amazing on you. I've used Gressa skincare and the boost so far. May I ask what skin type you have please? (trying to figure out if the foundation would work on dry skin as sometimes matte finish can be not so great). Thanks so much, Wonderlusting! My skin type is normal to combination but, as long as you moisturize well, this foundation should work well...it even contains natural oils! Excellent review. Extremely thorough. Like you, I'm obsessed with this foundation. I'm in 04 but I also use 05 for a natural contour. Thank you so much, Joana...glad you have found a match in this marvelous formula! Your hair is so pretty! I wanted to ask you what is the dewiest foundation you have ever tried? I have Chanel Vitalumiere and Armani Luminous silk but I want to try something new. Maybe Tom Ford Traceless original foundation or something else? Thanks a lot! Thank you so much, Ena! With regards to your question, some of the dewiest foundations I've tried are the By Terry Sheer Expert, Tom Ford Traceless, Amore Pacific Cushion Compact and Koh Gen Do Aqua Foundation. How do you like the brush? Is it worth buying? Thank you so much, Miriam! I like this better than the KA Sensual Skin Fluid Foundation as it has more coverage overall and the Kjaer Weis is lovely but finding a shade match is a bit challenging for darker skin tones. The Gressa has a soft matte finish and so does the KA SSFF but I think that the Gressa looks more natural, overall! Do you think that the Gressa or Kjaer Weis Foundation wears better? Not considering shade choice. Could you wear the Kjaer Weis Blush onto of this foundation or do you feel things will just slide off since it is an oil based foundation? And does it wear well during the day? Thanks. Thanks for the question. I really like the velvet/slightly glowy finish that the Gressa takes on as the day progresses...the Kjaer Weis is more matte on my skin and looks good, but I don't have a current shade match for my summer NC 27 or so skin. I think you could definitely apply the KW blush on top of Gressa as once it sets, the foundation doesn't slide around! Thank you for your review. It was very helpful!